Windows 10 includes the ability to edit the physical address (MAC) for your network adapters. Find out how to do it and why you would want to. As we’ve explained in our article on how to find your MAC address, a MAC address serves as a permanent, physical identifier for any device that connects to a network. That includes your phone, your router, your computer, your printer, your Apple TV, anything that connects to your internet. If your computer has an Ethernet port and a WiFi adapter, you have two MAC addresses: one for Ethernet and one for wireless. MAC addresses are useful for identifying devices on a network. For home users, you might use MAC filtering to restrict access to your WiFi network. The reason that a MAC address works better for these administrative tasks is that, unlike IP addresses, the MAC address doesn’t change. Or at least it’s not supposed to. The MAC address is “burned-in” to the physical device at the factory. But it’s fairly simple to change your MAC address by “spoofing” it as another MAC address. MAC spoofing can be used maliciously to circumvent network controls, but it’s really only effective for blacklists—that is if someone specifically blocked your device from the network. For whitelists, you’d have to know the MAC address of a specific device you’re trying to spoof. Changing your MAC address has legitimate uses as well. You can use it to test your own MAC filtering settings. Or you can use it to assign specific rules to a set of devices within a certain MAC address range. At any rate, the fact that you’ve read this far means you probably have a vested interest in changing your MAC address. So, without further ado, here’s how to do it. Press Windows key + X on your keyboard then click Device Manager. 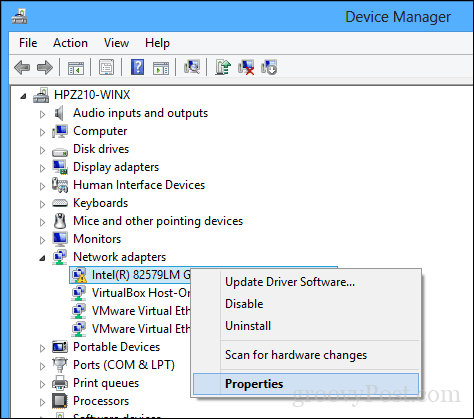 Expand Network adapters, right-click your Ethernet or Wireless adapter then click Properties. Select the Advanced tab. Within the Property box, scroll down then select Locally Administered Address then select the Value radio box; there you will see your adapters MAC address. To edit the address, click in the value box then clear its contents then enter a new address. A Mac address consists of six pairs of hexadecimal digits. Enter a new set without the hyphens, click OK then restart your computer. To confirm the change, open Start, type: CMD, right-click CMD then click Run as administrator. At the command prompt, type: ipconfig/all then hit Enter to check the physical address. You can also open Start > Settings > Network & Internet, click the connection name then scroll down to view the Physical address (MAC). It doesn’t get any easier than that. Drop a line in the comments and let us know what you think. There is no chance you accidentally hi jacks another device’s MAC address thereby causing all kind of trouble? Accidentally? Do you know how high the chance for that is? I do know, its 1/(1,741713362 × 10^10), so pretty darn small. After a Windows Update two machines with very similar hardware and Windows 10 Pro presented the same MAC address! After going crazy for a while, I just simply changed the MAC address on one machine and all worked out. Before the upgrade both machines were working perfectly in the same LAN, connected to the same switch. Thank you for your attention. The motherboard is ASUS with an embedded NIC. 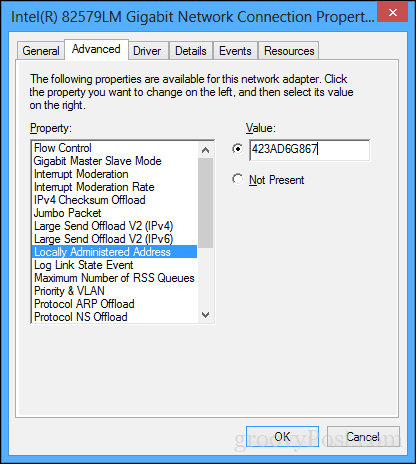 Realtek Network Adapters do not have this parameter, at least not with the driver I have installed. Can’t change mac, I have a Belkin adapter because motherboard doesn’t come with Wi-Fi so in properties for the adapter there is no locally administered address or much of anything really. It has 3 options in the box, 802.11d, Beacon Interval, and Wireless Mode. Please help thank you.